A scholarship or assistantship presented to a nursing student (graduate and/or undergraduate) who has demonstrated academic excellence (minimum of 3.0 GPA) and a sincere interest in older adults with vision and other sensory impairments or adults with sensory impairments. Dr. Jeanne K. Buxbaum earned B.S. (1938) and Ph.D. (1941) degrees in chemistry from the Massachusetts Institute of Technology School of Science and an M.B.A. (1974) from the University of Delaware . She was the first Ph.D.-prepared woman chemist employed by DuPont Company, where she worked until her retirement in the late 1980s. She was married to Edwin Buxbaum, Ph.D., an organic chemist and anthropologist, who predeceased Jeanne. They had no children together. 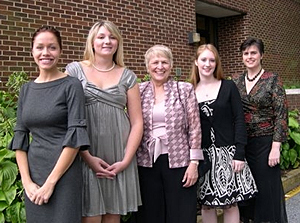 Dr. Buxbaum was a member of Sigma Xi (science honorary society), Beta Gamma Sigma (business administration honorary society), and the Association of Chemical Engineers. 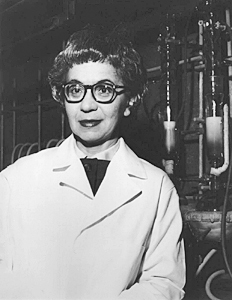 She was co-inventor on a patent issued in Canada to DuPont Company for a dye dispersion process. She was an avid gardener and passionate about classical music. At age 87, Dr. Buxbaum was frail and had lost her sight due to macular degeneration; she was cared for by professional nurses until her death. 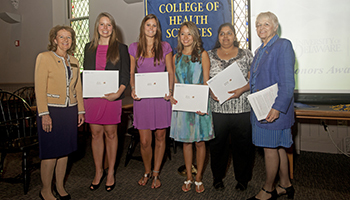 She left a large portion of her estate to the University of Delaware , establishing the Jeanne K. Buxbaum Scholarships for undergraduate and graduate students in Nursing and the Jeanne K. Buxbaum Chair of Nursing Science – all of which are focused on aging, specifically those aspects of aging associated with frailty in late life, such as sensory losses. Page, and Hannah Draper before leaving for the Gala. 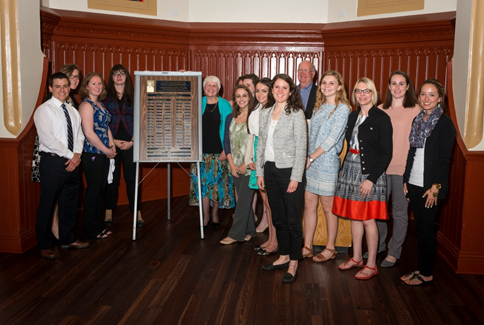 Dr. Veronica Rempusheski, Jeanne K. Buxbaum Chair of Nursing Science and Dr. W. Wayne Surles, Endowment Trustee, gather with 13 former and current Buxbaum scholars to celebrate the unveiling of the Jeanne K. Buxbaum Endowment Legacy plaque at Daugherty Hall on May 1, 2015.